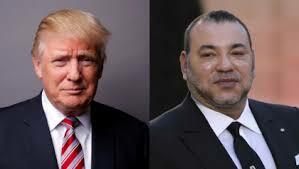 King Mohammed VI of Morocco has voiced his “deep concern and that of Arab and Muslim countries” over the U.S. administration’s plan to recognize Jerusalem as the capital of Israel and to move its embassy to this city. In a message he addressed, in his capacity as Chairman of Al Quds Committee of the Organization of Islamic Cooperation – a grouping that comprises 57 countries representing over one billion citizens, to President Donald Trump, the Moroccan King stressed the importance of the city of Jerusalem, not only to the parties to the conflict, but also to the followers of the three revealed religions. With its unique religious character, historical identity and special political symbolism, the city of Jerusalem “should remain a land as well as a symbol of coexistence and tolerance among all people”, said the royal message, recalling the great determination showed by Mr. Trump to revive the peace process between the Palestinians and the Israelis. The US Administration’s intention to recognize Jerusalem as the capital of Israel and to transfer the United States’ Embassy to that city, “would have a negative impact on prospects for achieving a just, comprehensive settlement of the Palestinian-Israeli conflict, particularly as the United States of America is one of the main sponsors of the peace process – one that enjoys the trust of all parties,” the Monarch pointed out. “As is clearly indicated in the relevant international resolutions, especially those of the Security Council, Jerusalem is at the heart of final status issues. For this reason, its legal status needs to be preserved and nothing should be undertaken that might affect its current political status,” the King insisted. The Moroccan Monarch who underlined that the Middle East region is in the grip of several serious crises, in addition to a series of tensions and many perils, warned against “taking any measure, which could fuel the feelings of injustice and frustration that extremism and terrorism feed on, undermining the fragile stability in the region or frustrating hopes for meaningful negotiations to achieve the vision of the international community concerning a two-State solution”. The Monarch went on to say in the conclusion of his message that the Kingdom of Morocco, which has untiringly worked for the achievement of a just, comprehensive peace in the region, firmly believes that the US Administration’s far-sightedness as well as the President’s personal commitment to peace and stability in the region, and his resolve to facilitate the revival of the peace process and avoid any measure that might impede the peace process or ruin it altogether. In this connection, King Mohammed VI reiterated in a phone call Tuesday with President of Palestine Mahmoud Abbas “Morocco’s strong and unwavering support for the brotherly Palestinian people in defending their just cause and legitimate rights, mainly concerning the status of Al Quds Asharif,” announced the Royal Office in a statement. The King “voiced his flat refusal of any action that could undermine the multi-religious aspect of the holy city or alter its legal and political status,” the statement added. The Palestinian president, on his part, hailed the King’s role and action, and deplored the fact that the American administration’s agenda includes such “inappropriate initiative”. He expressed the deep concern of the Palestinian authority over the serious consequences of this matter on the peace process in the Middle East and the region’s security and stability, the statement noted. It added that the two leaders agreed to maintain direct contacts and continuous consultations on this issue, as well as a close coordination between the two governments to set, together, steps to take and actions to undertake. In a message he addressed last week to the Chairman of the Committee on the Exercise of the Inalienable Rights of the Palestinian People, King Mohammed VI had stressed the need for Israel, as the occupying power, to “respect the historical and legal status of the al-Aqsa Mosque and the al-Aqsa Mosque Compound and stop all unilateral measures aimed at changing the Arab, Islamic and Christian identity of East al-Quds”. And last July, the King sent a letter to the UN Secretary-General, drawing his attention to the Israeli authorities’ continuing and systematic violations in al-Quds and in al-Aqsa Mosque designed to impose new facts on the ground. Trump’s decision is expected to be announced in a speech on Wednesday and if the reports are confirmed, that would fan the flames of the Palestinian-Israeli conflict and would probably spark protests across the Arab-Islamic world. Posted by Jaber Ali on Dec 5 2017. Filed under Headlines, World News. You can follow any responses to this entry through the RSS 2.0. Both comments and pings are currently closed.